It is sometimes hard to take in the fact that 45 years have passed since the Shanghai Communiqué was issued; it seems to have happened only yesterday. Yet the communiqué has stood the test of time and served both countries well for nearly half a century. A visit by a United States president to a country which his country had no diplomatic relations with, and hadn't even formally recognized, was an unprecedented event. The "oh's" and "ah's" that I heard echoing down the corridors of our Ministry of Foreign Affairs office when China's state radio broadcast in July 1971 that U.S. President Richard Nixon would visit China still ring in my ears. It was something very unexpected yet welcome. It was at a time when the "cultural revolution" (1966-76) still prevailed and slogans such as "Down with U.S. imperialism" were still commonly seen on walls in large streets as well as small lanes. It was my fortune to be an interpreter during that historic visit. I was working in the ministry's Department of American and Oceanian Affairs. At that time, there were only about a dozen staffers working on the American desk. Now it is one of the largest teams in the ministry. In conventional thinking, such a visit would call for some kind of document to be issued to inform the world what the two sides thought after their leaders had met for the first time and talked to each other. The traditional format of such a document would have been to say that both sides agreed on this and that and that was the framework of the initial draft the U.S. side presented. However, the Chinese side felt it would be better to call a spade a spade. The U.S. side, though they seemed to be slightly taken aback at first, soon agreed. After some hassling over the wording, the joint communiqué that we see today was produced. It may well be a unique document for it first listed the basic views of each side on international and bilateral issues, many of which did not coincide, and indeed, some were entirely different. It then went on to state what both sides had agreed on. This reflected the true state of relations between the two countries. There were many basic differences in their cultural backgrounds, social systems, ideology and national interests as well as differing views on specific issues. However, there was also common ground, and both sides were willing to work together for their common interests. That such an unconventional document could have seen the light of day; indeed, that such a visit could take place and lead to the normalization of China-U.S. relations, was not an accident. It was born out of the circumstances at that time and the wisdom of the leaders of both countries. When Chairman Mao Zedong met with President Nixon on the first day of the visit, he noted that Nixon had mentioned he envisioned a philosophical discourse. The chairman responded by saying that he would discuss philosophical questions. Indeed, in that meeting that lasted 65 minutes, rather than bickering over minor issues, the two sides covered much broader ground, stating their respective positions candidly in a friendly atmosphere. As an eyewitness, what impressed me most about the visit was how leaders of the two countries had the same message, despite not speaking the same language. 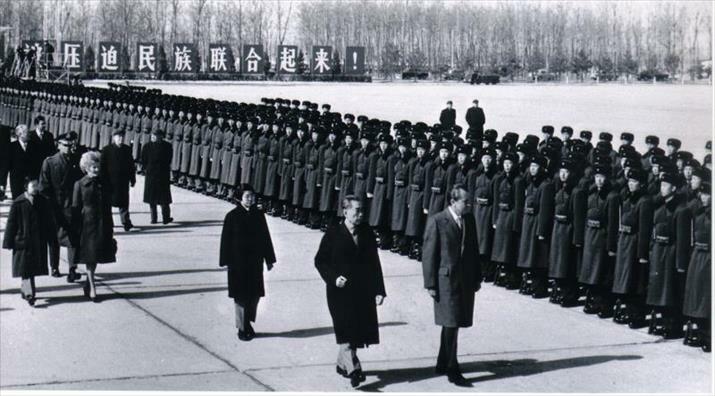 At the welcoming banquet Premier Zhou Enlai hosted for Nixon, the premier said in his toast that "The social systems of China and the United States are fundamentally different and there exist great differences between the Chinese Government and the United States Government. However, these differences should not hinder China and the United States from establishing normal state relations on the basis of the Five Principles of mutual respect for sovereignty and territorial integrity, mutual non-aggression, non-interference in each other's internal affairs, equality and mutual benefit, and peaceful coexistence; still less should they lead to war... We hope that, through a frank exchange of views between our two sides to gain a clearer notion of our differences and make efforts to find common ground, a new start can be made in the relations between our two countries." In his toast, President Nixon said, "In the spirit of frankness which I hope will characterize our talks in this week, let us recognize at the outset these points: We have at times in the past been enemies. We have great differences today. What brings us together is that we have common interests which transcend those differences. As we discuss our differences, neither of us will compromise our principles. But while we cannot close the gulf between us, we can try to bridge it so that we may be able to talk across it." It was precisely because both sides took the long view and the broad view with strategic perceptions that they were able to avoid becoming entangled in specific issues and build a thriving relationship over the years, despite the many problems that cropped up in the process. In the Shanghai Communiqué, it was written down for history that "There are essential differences between China and the United States in their social systems and foreign policies. However, the two sides agreed that countries, regardless of their social systems, should conduct their relations on the principles of respect for the sovereignty and territorial integrity of all states, equality and mutual benefit, and peaceful coexistence. International disputes should be settled on this basis, without resorting to the use or threat of force. The United States and the People's Republic of China are prepared to apply these principles to their mutual relations." Even after 45 years, the spirit of the Shanghai Communiqué remains relevant. The two countries still have many contentious issues, and may continue to face many problems in the foreseeable future. Yet if we are able to maintain a strategic perception, take the long view and the broad view, we should be able to work our way through it all. In the Shanghai Communiqué, the Chinese side reaffirmed that "The Government of the People's Republic of China is the sole legal government of China" and that "Taiwan is a province of China which has long been returned to the motherland," while the U.S. side declared that "The United States acknowledges that all Chinese on either side of the Taiwan Strait maintain there is but one China and that Taiwan is a part of China. The United States Government does not challenge that position." In their Joint Communiqué of January 1, 1979 on the establishment of diplomatic relations, both sides stated even more clearly that "The United States of America recognizes the Government of the People's Republic of China as the sole legal Government of China" and that "The Government of the United States of America acknowledges the Chinese position that there is but one China and Taiwan is part of China." They also stated that both sides "reaffirm the principles agreed on by the two sides in the Shanghai Communiqué." The spirit of the Shanghai Communiqué thereby continues to nourish bilateral relations. Yet we sometimes see with dismay that during their campaigns presidential candidates tend to concentrate on winning votes rather than the future conduct of international affairs. When they enter the White House, they may unwittingly commit blunders like elephants in a china shop. This could partially be the fault of ill advice. However, wise leaders will always be able to find the right path and advance along it with success. It is with this in mind that we look to the future of China-U.S. relations.